While many programs are losing funds, MIECHV is a victim not of budget cuts, but of congressional distraction. Alongside the Children’s Health Insurance Program (CHIP), MIECHV has been eclipsed first by the failed ACA repeal and then by the only policy issue on anyone’s mind for the last month: taxes. Barring a government shutdown, we can expect Congress to pass a tardy MIECHV reauthorization in an omnibus spending bill later this month. In the meantime, though, existing home visiting services are not immune to federal inertia. Uncertainty may do the work of a more explicit rollback as states and providers question whether their programs will be funded in the long run. Home visiting consists of visits from social workers, parent educators, or registered nurses to low-income families with pregnant mothers or infants in the home. Gaps in child development open up very early, in part because of a “parenting gap.” Home visiting attempts to narrow these gaps, by providing what we have elsewhere labeled “pre-pre-K” services. MIECHV is evidence-based at its core. It is one of six evidence-based initiatives Haskins and coauthor Greg Margolis review and applaud in Show Me the Evidence: Obama’s Fight for Rigor and Results in Social Policy. Under MIECHV, the majority of federal home visiting funds can only be put toward models that have demonstrated evidence of effectiveness in randomized controlled trials (RCTs) or quasi-experimental designs (QEDs). To encourage innovation, up to 25 percent of funds may be used for promising new models that have not yet met these standards of evidence. 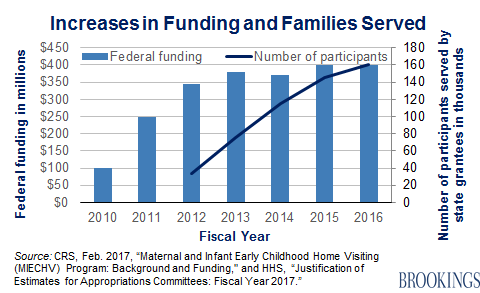 Additionally, Congress has reserved three percent of federal funding for an independent national evaluation of the MIECHV program, known as the Maternal and Infant Home Visiting Program Evaluation (MIHOPE). This ongoing study covers over 4,200 families who have been randomly assigned to home visiting services in 87 locations across 12 states. The results of MIHOPE will be released in 2018. Articles about home visiting tend to look like alphabet soup. Here’s what all of those acronyms mean. MIECHV: Maternal, Infant, and Early Childhood Home Visiting. Federal legislation that authorizes grants to states, territories, and tribes to fund evidence-based home visiting programs. First enacted in 2010. HomVEE: Home Visiting Evidence of Effectiveness. An annual systematic review of home visiting studies launched by the Department of Health and Human Services in 2009. Identifies evidence-based models that are eligible for MIECHV funds. MIHOPE: Mother and Infant Home Visiting Program Evaluation. Legislatively mandated national evaluation of four major home visiting models, based on a large-scale randomized control trial. Results are expected in 2018. NFP, HFA, PAT, EHS-HV: The Nurse-Family Partnership, Healthy Families America, Parents As Teachers, and Early Head Start-Home Visiting. The four national home visiting models being evaluated by MIHOPE. CHIP: Children’s Health Insurance Program. Home visiting funds for 2016 and 2017 were authorized through the Medicare Access and CHIP Reauthorization Act of 2015. This year, MIECHV reauthorization may once again ride on a CHIP reauthorization bill. Funding for CHIP also expired on September 30 of this year. Increase children’s school readiness and improve school performance. Heckman et al. found that improved achievement test scores for home-visited boys persisted through age 12 in an evaluation of the Nurse-Family Partnership in Memphis. Another study found that at age 7, home-visited children in New York were less likely to repeat a grade and that home-visited girls were more likely to excel academically than the control group. Improve newborn and maternal health. Studies of the Nurse-Family Partnership have found that home-visited women had fewer preterm births, smoked less during pregnancy, and had fewer subsequent pregnancies than women who did not receive home visits. Heckman et al. also found improvements in maternal mental health. Reduce child maltreatment and intimate partner violence. In a meta-analysis of 40 evaluation studies, Greeraert et al. found that home visiting contributes to modest but significant reductions in child abuse and neglect. Another meta-analysis concluded that home visiting programs have the potential to reduce intimate partner violence (IPV) if home visitors are trained to recognize and intervene in IPV. Reduce risky behavior among adolescents. A 19-year follow-up of a randomized trial in Elmira, NY, found that girls who received home visits as infants (or whose mothers received home visits during pregnancy) had fewer lifetime arrests and convictions than girls in the comparison group. Another study found that the same home visiting program reduced 12-year-old children’s use of cigarettes, alcohol, and marijuana. Help families become more economically self-sufficient. According to a recent literature review conducted as part of MIHOPE, home visiting programs have been shown to increase parents’ earnings by reducing maternal alcohol abuse and increasing parents’ high school graduation rates. These improvements reduce families’ need for public assistance programs such as Temporary Assistance for Needy Families (TANF) and Medicaid. Two MIECHV reauthorization bills were referred to the Senate Finance Committee at the end of September. One version (H.R.2824) passed the House a few days before the deadline. The other (S.1829) never came to a vote. It is now more likely that MIECHV will be tied together with other social programs in need of reauthorization (like CHIP). In October, the Senate Finance Committee released a discussion draft of Medicare and social services extender programs that would reauthorize MIECHV for two years–a much shorter time period than the five-year reauthorization in S.1829 and H.R.2824. This two-year funding extension is, however, consistent with the last reauthorization, which funded the program for FY 2016 and FY 2017, and might reappear in a December omnibus spending bill. Home visiting programs generally commit to serve families for at least 2.5 years, so MIECHV would need to be re-reauthorized before early-2018 enrollees complete their programs. Another provision to watch out for: Matching requirements for states and territories. The House reauthorization bill would have required a funding match beginning in 2020, rising to a dollar-for-dollar match by 2022. This is one reason that almost all Democrats voted against the bill. Most states are not currently matching MIECHV funds, but the bill’s supporters are betting that the threat of losing unmatched federal funding may incentivize more to do so. If a matching requirement is not attached to this year’s (probable) reauthorization, the issue may resurface during the next MIECHV reauthorization season. The matching requirement and two-year reauthorization period might have generated greater debate under an on-time reauthorization. As it is, all eyes are on securing federal funding at all, let alone for five years or without a state match. Home visiting programs are continuing to operate while funding is in limbo, but if MIECHV is not reauthorized by the end of December, we will begin to see “cracks,” according to Karen Howard of First Focus. Howard says that when money runs out, programs will likely cut down on outreach efforts, staff training, professional development, and continuing quality assurance activities to conserve funds. Even if funding is reauthorized in the next few weeks, some of the damage of delay has already been done. A program manager for the Parents as Teachers home visiting program in Idaho Falls told Education Week at the beginning of October that the program would hold off on recruiting new families until it was clear that funding would be available in the future. The home visitation director for Iowa’s Department of Public Health plans to freeze enrollment in January to save remaining funds for families who are already enrolled, according to a report in Governing magazine. States have already enacted their FY 2018 budgets and so will not be able to pick up any unanticipated shortfall in federal MIECHV funding. A Kaiser Family Foundation survey found that 48 states assumed continuation of federal CHIP funding (which expired alongside MIECHV) in their state budgets. The story is probably similar for home visiting. Accountability is a key component of evidence-based policymaking. Short-term extensions allow Congress to keep a close watch on federally funded programs, but this only works if Congress is actually watching. When deadlines are ignored, social services suffer. By the time Congress turns its attention back to home visiting, it may find a less robust program than it left behind.